Russia wants all non-Syrian forces withdrawn from southern areas bordering Israel. More on this below. Washington, NATO, their so-called “coalition” partners and Israel are waging undeclared war on Syria, clearly violating international law. Nothing under international law prohibits a nation from requesting and receiving help from other countries, groups, entities or individuals for any lawful purpose, including self-defense when attacked or if aggression is imminent. There’s nothing civil about war in Syria, correctly explained by Bashar al-Assad in an interview with RT, published on Thursday. He also explained Iranian military advisors alone are in Syria “which we don’t conceal,” he said, no Islamic Republic combat forces there. All casualties from US, UK, French and Israeli attacks were Syrian, not Iranian, he stressed, praising vital Russian aid. In March 2011, Obama launched naked aggression on the country, using ISIS and other terrorists as imperial foot soldiers. Trump escalated what he began, war in its 8th year with no breakthroughs for resolution because Washington wants endless war and regime change, part of its strategy to replace all sovereign independent governments with pro-Western puppet regimes. America’s rage for global dominance threatens something far more serious in Syria than already if not challenged with strength and resolve. Russia’s intervention in September 2015 to help Syria combat terrorism (at its request) was legal and admirable. Yet Putin hasn’t acted boldly enough to challenge and help defeat the US-supported scourge. True enough he has no obligation to defend Syria or any other country, obligated only to preserve and protect Russia’s security and territorial integrity from foreign or internal threats. Yet he’s geopolitically savvy, knowing if Syria goes, Iran is next, the prime regional target by Washington and Israel. If both fall, Russia and China remain the only sovereign independent nations standing in the way of unchallenged US dominance. Both countries are the key ones on Washington’s target list for regime change by color revolution or war, preceded by economic and financial strangulation on Russia (China likely later) the way Iran, North Korea, and Venezuela are targeted now. The softer Putin is on US, UK, French and Israeli aggression, the more they’re able to get away with uncontested. Who’ll challenge them in the Middle East if not Russia? Its super-weapons exceeding America’s best make it the world’s leading superpower, a strength it’s able to use for right over wrong. Washington is Russia’s sworn enemy, NATO and Israel appendages of its imperial agenda. Cooperating with them in Syria or elsewhere is counterproductive, serving their interests, harming Russia’s, Syria’s, and other independent governments. On Wednesday, Netanyahu vowed to strike anywhere in Syria nationwide on the phony pretext of targeting Iranian forces in the country. Only military advisors are there, not combat troops. Iranian military advisors are opposite no one there except US and Israeli-supported terrorists. Tehran clearly said it’ll remain in the country as long as Damascus values and wants its presence – operating from Syrian bases, not its own. The goal of both countries is liberating Syria from ISIS and other terrorists, neither threatening Israel or any other regional nations. 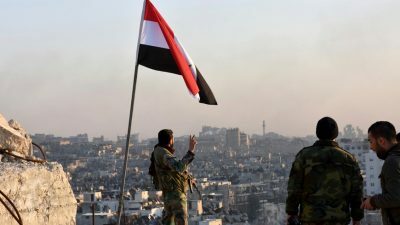 Syrian forces are preparing for a major offensive to free areas bordering Jordan from US/Israeli-supported terrorists – unless they voluntarily agree to surrender their heavy weapons and leave territory they occupy illegally. Reportedly only government troops will be involved in their southern offensive. It’s their sovereign right to accept help from Iran and Hezbollah. No one may legitimately demand otherwise. On Wednesday, Sergey Lavrov said all non-Syrian forces should withdraw from areas near Israel’s border with Jordan. It includes illegally occupied Syria’s Golan territory. According to Syria’s UN envoy Bashar al-Jaafari, US forces occupy around one-third of northern and southern parts of the country. Washington and its imperial partners have been terror-bombing Syria since September 2014 – massacring countless thousands of civilians, destroying vital infrastructure, supporting ISIS and other terrorist groups. By its own admission, Israel terror-bombed Syrian targets countless times throughout much of the war. NATO nations, Saudi Arabia, Jordan and other states are involved in US-led aggression in Syria. Instead of condemning what’s going on, Russia is largely silent – dealing with Washington and Israel as “partners”, its good will not reciprocated in kind. The more latitude given regimes running both countries, as well as Britain, France, Saudi Arabia and Jordan, the more they take advantage, believing Putin shows weakness, not strength. The only language Washington and Israel understand is force. Diplomacy achieves nothing in dealing with them – not so far so why expect them turning a new leaf ahead. its territory, unable to stop most or all of it. The only effective way to deal with US, Israeli and allied aggression is by challenging it forcefully. Six years of Russian diplomatic efforts failed to achieve conflict resolution. Nothing suggests continued efforts can succeed in dealing with nations wanting regime change, deploring peace. Israel’s “primary focus…is preventing the entrenchment of Iran and its proxies in Syria” – initially seeking a “Russian-Israeli agreement” for Iran to be no closer than 60 km from Israeli occupied Golan, ahead of wanting no Iranian military presence in Syria anywhere in the country. According to AP News, Moscow wants a deal with Israel, involving Russian military police deployed in southern Syria, replacing the presence of foreign forces, along with US/Israeli-supported terrorists surrendering their heavy weapons. Like Washington and NATO, Israel’s “primary focus” is regime change, wanting a regional rival eliminated, isolating Iran, ahead of a similar strategy against its sovereign government – aiming for regional dominance along with America’s presence. Confronting Washington and Israel forcefully in Syria is high-risk for Russia – higher risk by not doing it, I believe. Appeasement doesn’t work with hegemons – never did, never will, a sign of weakness, not strength. Failure to challenge US/NATO/Israeli aggression risks something far more serious than already. Continuing what hasn’t worked is counterproductive and defeatist. A show of strength is needed by Russia, a different approach than it’s pursued so far. Otherwise Syria could become another Afghanistan, a forever war with no end in sight.